If you are expecting this column to talk about how successful trade associations are member-driven, aligned with member objectives and “listen carefully” to their members, you can stop reading right now. I want to take a minute or two to talk about something different. Trade associations are strange places. They suffer from an ongoing identity crisis because they reside at the nexus of corporate America and the political process – a clash of cultures that is difficult to navigate. They are not-for-profit organizations but are expected to operate like the for-profit businesses and/or executives they represent. The degree of difficulty for trade association executives is high. Vast and varying constituencies compete for attention and resources. External pressures hit from all angles with high visibility – the media, congress, the courts, regulators and activist groups – are all on the radar. Uncertainty and insecurity are constant concerns. The operating landscape for trade associations is constantly changing. In fact, the trade association culture has undergone a metamorphosis over the last twenty years. For instance, external communication to consumers, once off-limits for most trade groups, is now commonplace as members look to leverage every drop of their dues investment to help solve marketplace challenges. Many are also now expected to facilitate and orchestrate value-driven dialogue between trade association members and their customers. 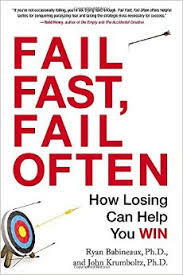 The 2013 self-help book, Fail Fast, Fail Often: How Losing Can Help You Win, counseled readers seeking success and happiness to focus on opportunities, not problems. Soon, that advice became the cause celeb among corporate executives seeking to transcend internal bureaucracy and group think in their organizations. Many openly confessed they wanted to mimic the successful culture at places like Apple and Google. “Fail often, fail fast” even seeped its way into trade association culture, popping up on the agendas of trade group leadership conferences and entering the name-dropping habits of soul-searching CEOs. There was just one problem. Failing often is a recipe for failure for trade associations. Placing your bet and spinning the roulette wheel as your operating model may work in the tech world or for deep-pocket companies, but it is the wrong approach for trade groups. Constant experimentation at resourced-constrained organizations like trade associations puts the organization and its reputation at risk. Member confidence wanes. Investment declines. Staff retention and morale take a hit. Operational ineffectiveness often follows. Of course, there are times when innovation and change are necessary. But constant change for change sake is meaningless. You’ve seen it before. Change the name and logo of the association. Change the org chart constantly. Change the committee structure. Change the strategic planning process. Change the annual review process. Change the list of priority issues. Bring in new consultants. Create new divisions. Then do it all over again. That’s just motion without progress. Flexible: Annual planning is essential, but it is important to remember trade groups don’t control their own destiny. The public policy and marketplace landscapes change constantly and a good trade association is able to re-direct its resources to confront unseen threats. Hard choices must be made about what projects to abandon or put on hold due to new challenges. Pro-active: The “defense is the best offense” operating model of many trade associations is long gone. Effective trade associations go on the offensive, telling their story to key audiences, including consumers, policymakers, the media and key opinion leaders. Execute: Operational excellence is not the first thing that comes to mind when most people think about their trade groups. But those that place a premium on it and get it right achieve their goals and receive high marks from members and external audiences. A brief word about strategic planning: Every trade association should do it, but never less than every five years. The strategic plan is a reality check, not a battle plan. Get it done and look at it a few times a year to make sure you are on track. In short, a culture of constant experimentation at trade associations does more harm than good. Whether you are a trade association executive or a member tasked with external governance responsibilities, promote a culture that is reliable, flexible, pro-active and places a premium on ideas and operational excellence.